Bermuda is featured in a PBS Newshour program about invasive lionfish, with scenes of the island shown, while local marine experts, in conjunction with visiting scientists, appear in a five minute segment that also reveals plans for a prototype lionfish-culling undersea robot. Bermuda’s lionfish experts included in the PBS program are Dr. Gretchen Goodbody-Gringley of BIOS, Chris Flook of the Department of Environment and Natural Resources, and Geoffrey Gardner of RISE. 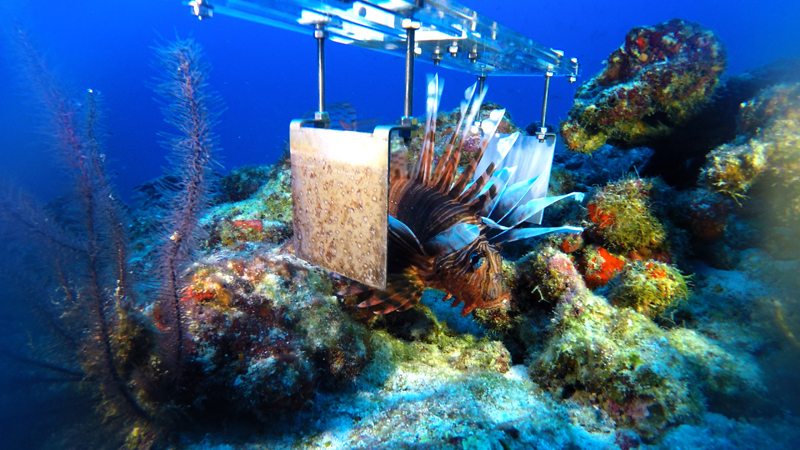 Nekton, RISE, BIOS, The Department of Environment and Natural Resources, and the Ocean Support Foundation seized the opportunity to collaborate on lionfish research over the last several weeks. The lionfish [Latin name Pterois] is native to the Indo-Pacific. Artificially introduced to the Atlantic by humans, it is estimated that there are more than one million off the coasts of Florida, Bermuda and throughout the Caribbean. They face no natural predators. They easily prey on local fish populations in non-native waters because lionfish are not recognised as a threat by native juvenile fish and crustaceans. This makes it possible for the invasives to eat as much as half their body weight per day. Sexually mature at just 12 months, females spawn approximately 30,000 eggs every four to five days. Deep ocean charity Nekton’s scientific research vessel was recently off the coast of Bermuda conducting the XL Catlin Deep Ocean Survey, a pioneering new multi-disciplinary marine research programme assessing the function, health and resilience of the deep ocean. “Our research has found dense aggregations of lionfish on deep reefs in Bermuda and, as a technical rebreather diver, the majority of my research on lionfish focuses on these “hot spots” at 200ft depth,” adds Dr Gretchen Goodbody-Gringley of BIOS, who participated in the Nekton Mission conducting research on lionfish and corals at depth. The frontrunner is a robot which uses an electro-fishing technique,” said Geoffrey Gardner of Robots In Service of the Environment [RISE]. The robotics team joined Nekton on its maiden scientific voyage off Bermuda to test a prototype that will operate remotely in deep water to hunt, kill and capture the invasive species. RISE, a start-up born in the robotics industry, wanted to observe how the lionfish reacted to prototype electrical paddles that can deliver the fatal charge. Once the fish’s behaviour is understood the paddles will be connected to an underwater robot operated via video link. The fish carcasses will be collected so they can be brought to market. Locally the show can be seen at 7:00 pm on Cablevision [channel 5] and WoW [channel 105]. It is tentatively scheduled to air on Friday night. 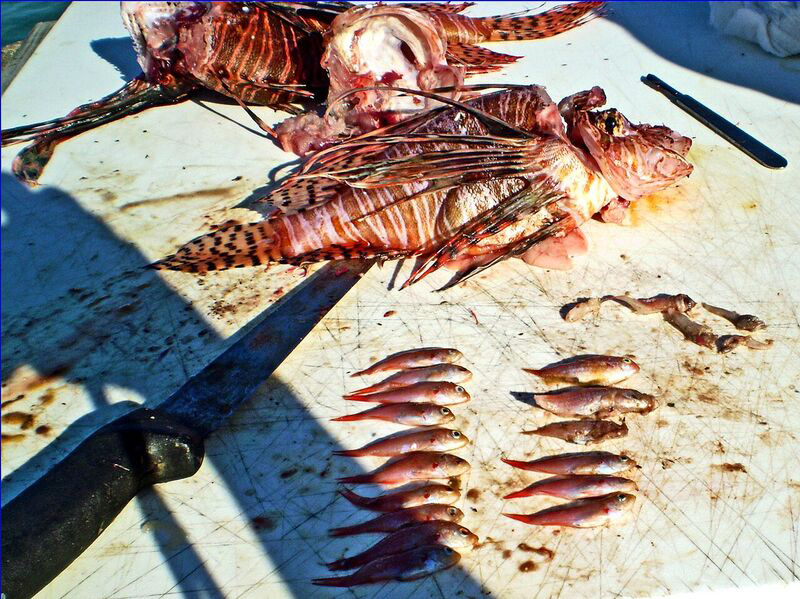 What a huge problem we have with Lionfish. Yet people continue to smuggle plants and animals in. The lionfish dilemma gets most of the attention but lets not forget about the Indian Laurel, Brazil Pepper and many other invasive plants, take the time to stop and yank one out of the ground just like spearing a lionfish. Take the time to lecture someone who thinks it is cool to smuggle a snake or some other exotic animal into our fragile ecosystem. Educate your kids about our environment and how precious it really is. You are just being Zoophobic & Botanophobic. PLP is the one to blame for the ill effects to our environment. They had 14 years to fix the issues and didn’t so we shouldn’t expect anyone else to be able to. It is what it is so live with it and except it like every other issue that the buck gets passed on. Politicising the issue is the first step to solving it. Although there are those who will disagree with this statement, including myself.